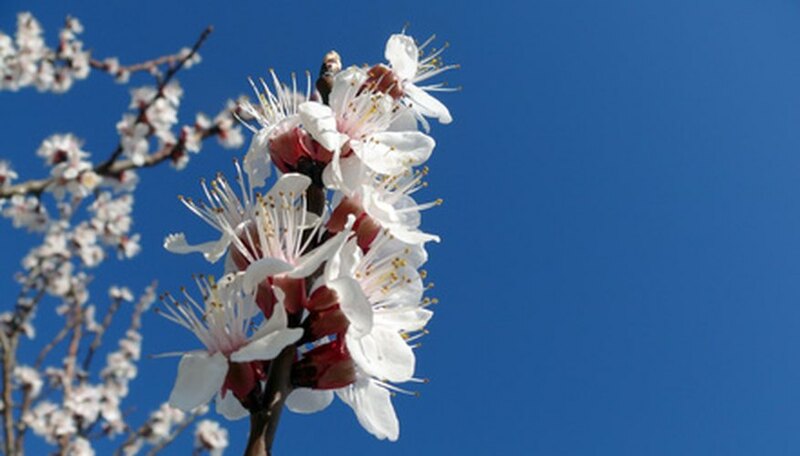 Almond (Prunus dulcis) trees have two types. One type produces sweet almonds, and the other type, bitter-tasting almonds. The sweet almond tree blooms with white flowers, while the bitter almond tree blooms in pale pink. White and pink flowering almond trees are both desirable for their ornamental value and for their almonds. Both types of this tree require the same care. Prunus dulcis is a small tree, growing to a maximum height of only 15 feet. The spread of the canopy is usually equal to the height of the tree. The tree blooms in early spring (March) with a profusion of white flowers that appear before the leaves uncurl. The flowers are creamy white, with five petals and a deep pink center. White flowering almond trees require a long, hot, dry growing period. They do not grow well in humid or cold climates. These trees grow best in U.S. Department of Agriculture (USDA) plant hardiness zones 7 through 9, according to the Missouri Botanical Garden. Almond trees thrive in full sunlight and well-draining, loamy or sandy soil. These trees have deep roots and will not grow well in tightly packed clay soils. Almond trees should be protected from cold winds and from freezing temperatures. Exposure to early fall or spring frosts can damage the tree enough that it will not produce fruit, according to the Missouri Botanical Garden. Almond trees are not hardy trees. They are susceptible to many insect pest problems, including aphids, scale and borer insects, which damage the sapwood of the trees. Tent caterpillars can defoliate a tree in just a few weeks, and so can Japanese beetles. These trees are also susceptible to diseases, especially fungal diseases such as powdery mildew, black knot and cankers. White flowering almond trees are small enough to grow in containers and make excellent patio or specimen trees. They are also grown for the commercial value of the almonds. Almonds are used in baking and cooking, and the oil of sweet almonds is even used in cosmetics, according to Purdue University. California, with its hot, dry valleys, produces almost 40 percent of the world's crop of almonds.